When homeowners across South Florida encounter various situations that result in a broken glass window repair Jupiter FL, they immediately realize the potential hazard and security risks that are associated with it. Whether it is the sharp edges of the glass or the possibility of burglary, a broken glass window or sliding glass door repair demands immediate attention and action for a swift glass repair. Incidentally, inexperienced individuals themselves should not attempt to repair glass windows or sliding glass doors. In order to ensure a sturdy and risk-free repair, one must rely on the professional services of a good glass repair company Jupiter FL. However, the selection process for these companies can often be daunting, especially when residents or business owners have not faced a similar situation in the past. The following section explains key considerations that customers must pay attention to, before they finalize their decision of a handing their glass repair project to a glass repair company Jupiter FL. Broken glass windows and glass doors in your home or business are a matter of great concern. In fact, it is a situation with a wide range of risks and threats associated with it. As a result, it is imperative that you must review the service offered by glass companies to identify one that provides immediate response with efficient action. For instance, Express Glass & Board Up Service Inc, delivers on to its promise of immediate response, 24/7 customer service, emergency board up service, site visit within 30 minutes of initial request, and the action time of glass replacement is done on site. Special Orders are done within hours not days. During your hunt for a glass repair expert Jupiter FL, you must review online sources and customer reviews to ensure that you select a company with highly skilled and fully trained staff. Another tip to make sure that you find a truly professional glass repair company Jupiter FL is that you should initiate open communication with the representatives. You must only trust a glass replacement company Jupiter FL that offers transparency of information about their material selection. For example at Express Glass & Board Up Service we offer a 5 year warranty on the quality of the high impact glass and a 10 year warranty on the insulated units. Customers could request a certificate of warranty upon request. Once you acquire knowledge on the types of material options the glass repair company Jupiter FL has, you must conduct a quick research on each material. This is how you can be confident about the quality of the materials. When looking for a residential glass repair service in Ft. Lauderdale or a West Palm Beach commercial glass repair service, homeowners and business owners should not confine their search to the services offered by various glass repair companies Jupiter FL. It is equally important to find an option that charges reasonable rates which are compatible with your budget. This is why Express Glass & Board Up Service offers Free Estimates and an Instant 10% Off. Another key concern of homeowners and business owners who are seeking glass replacement West Palm Beach FL by a professional glass repair company is based on its past records. One of the most effective ways to find this information is through the recorded testimonials by its previous customers. You can review Express Glass Testimonials as well as local reviews found in google places and google+ pages. A quick overview of these important factors can guide you to a good decision for a glass repair company Jupiter, FL. Jupiter is rich in history: the earliest known records of the Jupiter Inlet date as far back as 1565. 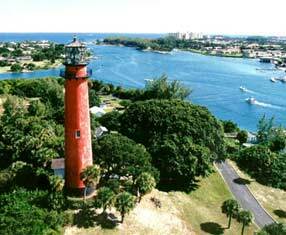 Jupiter’s most identifiable landmark, Jupiter Inlet Lighthouse, was erected in the 1800s. The stately red brick lighthouse continues to stand, ranging 105 feet into the sky, atop a 46-foot hill on the north shore of the Jupiter Inlet. Stretching to the Atlantic Ocean, Jupiter features a delightful tropical climate and truly that “small town” appeal with big city benefits. Jupiter is also the Spring Training home to not one, but two World Series pennant winning baseball teams: the Florida Marlins and the St. Louis Cardinals. But the boys of summer continue into the fall at Roger Dean Stadium with two additional Florida State teams: the Jupiter Hammerheads and the Palm Beach Cardinals. So grab a program and some peanuts and settle in for some great baseball action. Within walking distance to the stadium you will find Abacoa Town Center. Full of specialty shops and fashion boutiques; fine dining and casual cuisine, live music at the outdoor amphitheater, community events and daily entertainment, all within a Main Street atmosphere.